Now that all 6 snails are embroidered and ready to place on the outer fabric, it’s time to piece the outer fabric together. 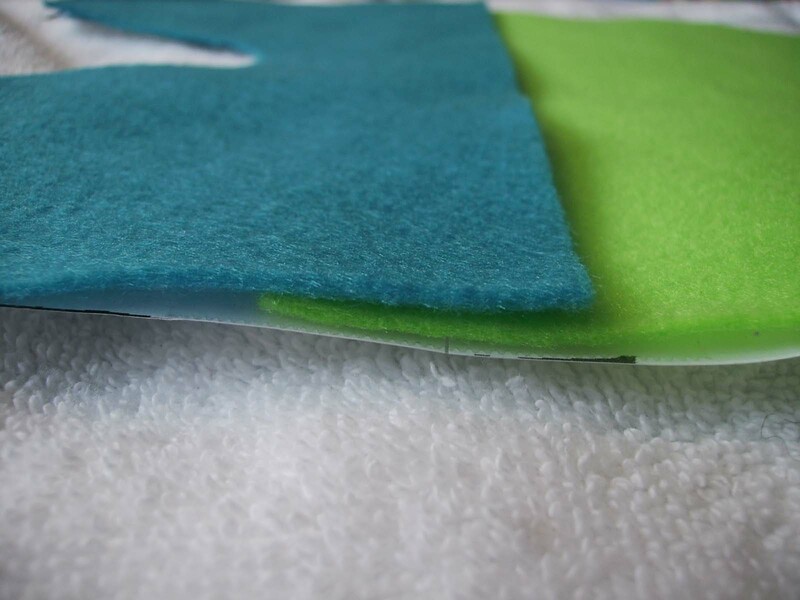 We cut out the outer fabric (felt) here in Part 9. The beginning of this “idea” is found in Part 1. Remember, the idea here is to piece together an entire purse outer fabric. 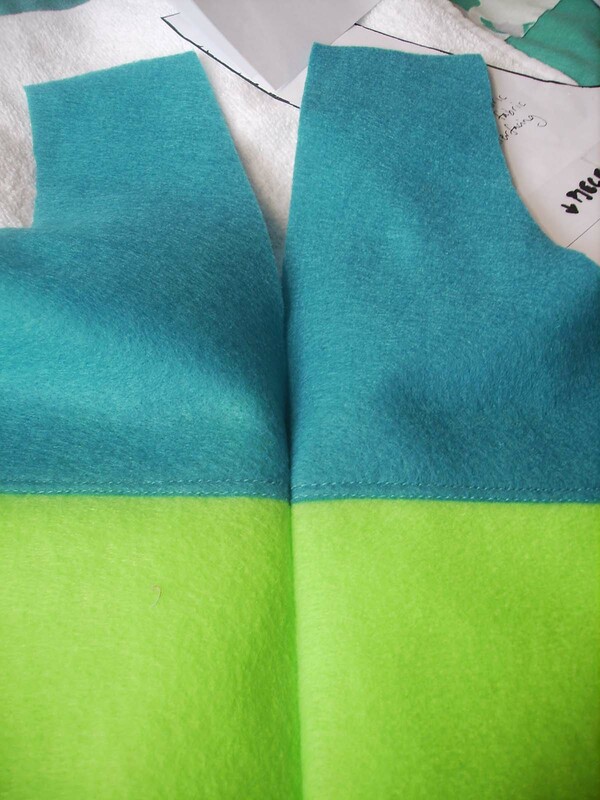 This is a alteration from the original pattern that simply calls for a Fat Quarter to be cut. 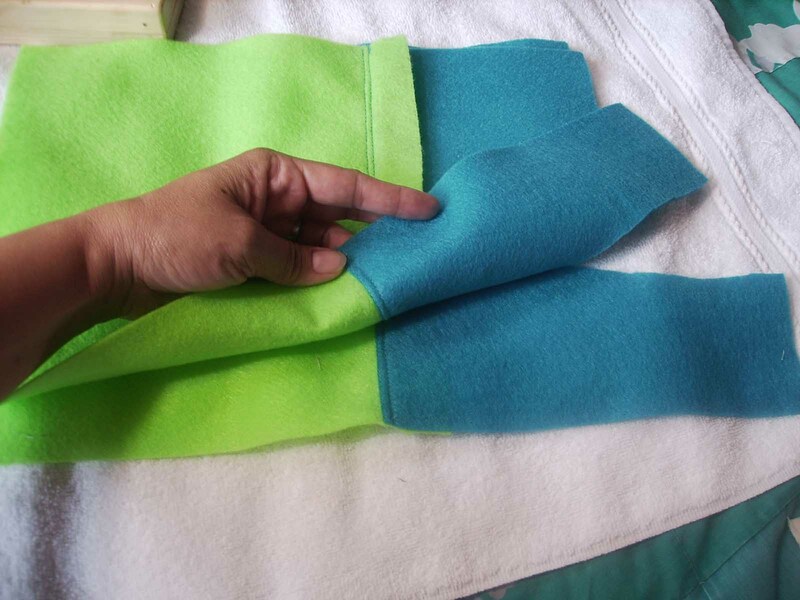 If you want to create your own outer purse fabric, this will help you to form the outer fabric to use for the purse. 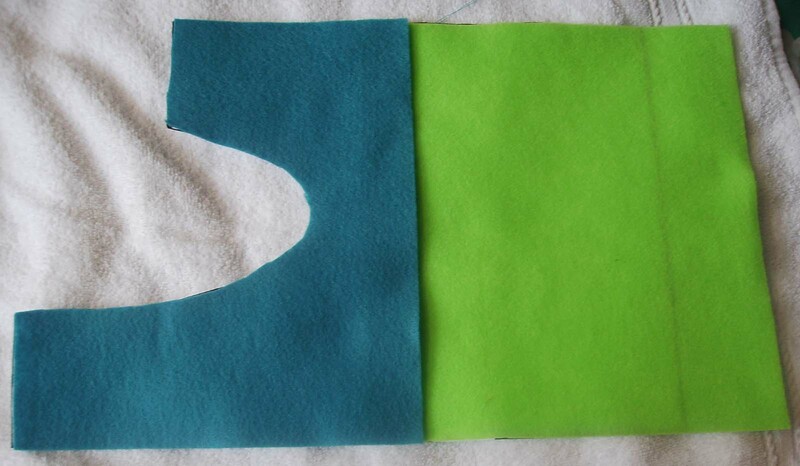 Here the 2 cut pieces are placed on the paper pattern to determine the exact overlap of the edges to create the correct size of the complete purse piece. 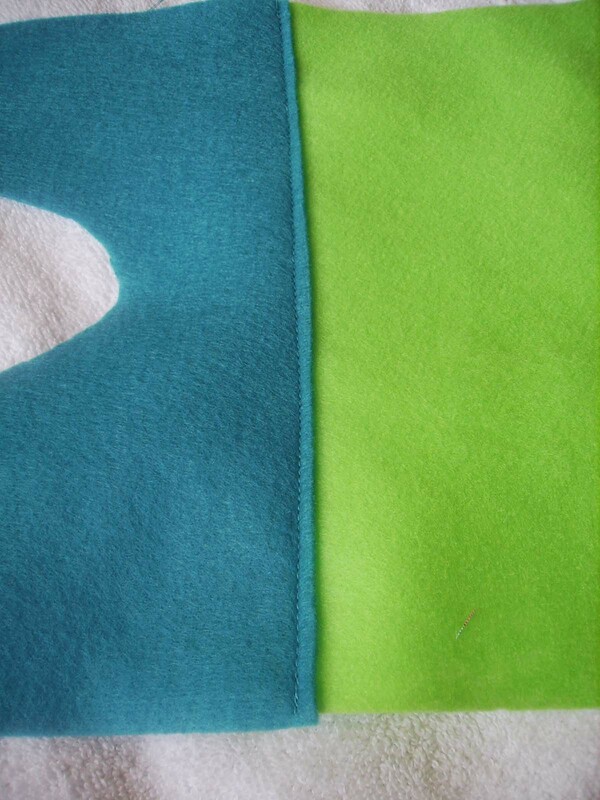 The overlap of the blue felt over the green felt. 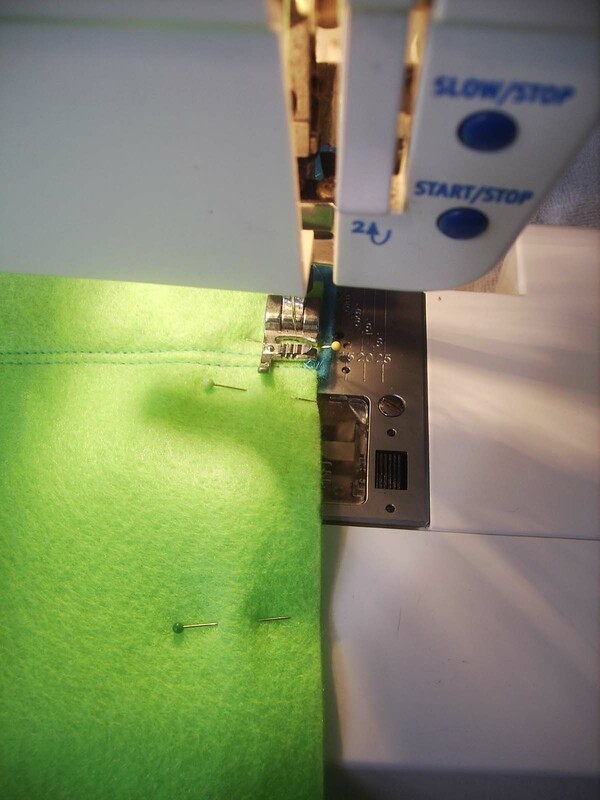 My sewing machine allows me to move the sewing needle left and right of the center of the foot. 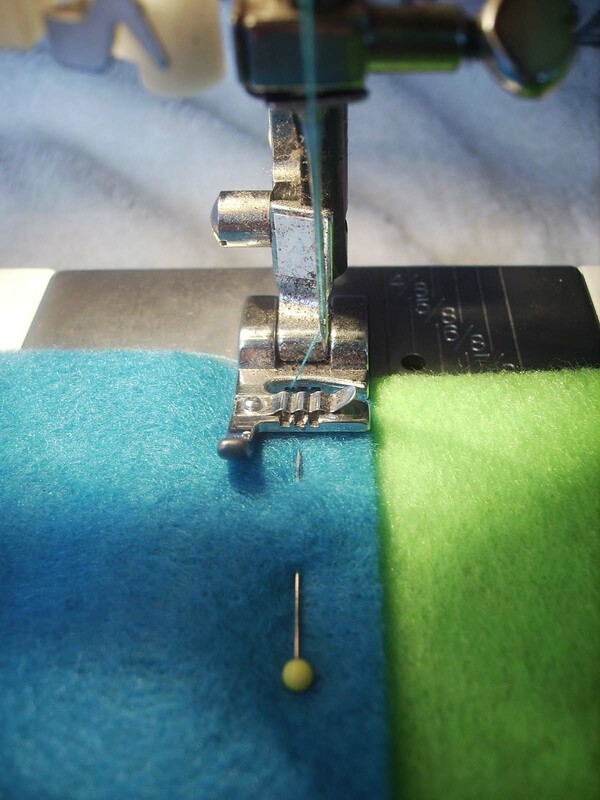 Here I use the foot to hold the fabric down and move the needle to the farthest right position to top stitch close to the edge of the blue felt. 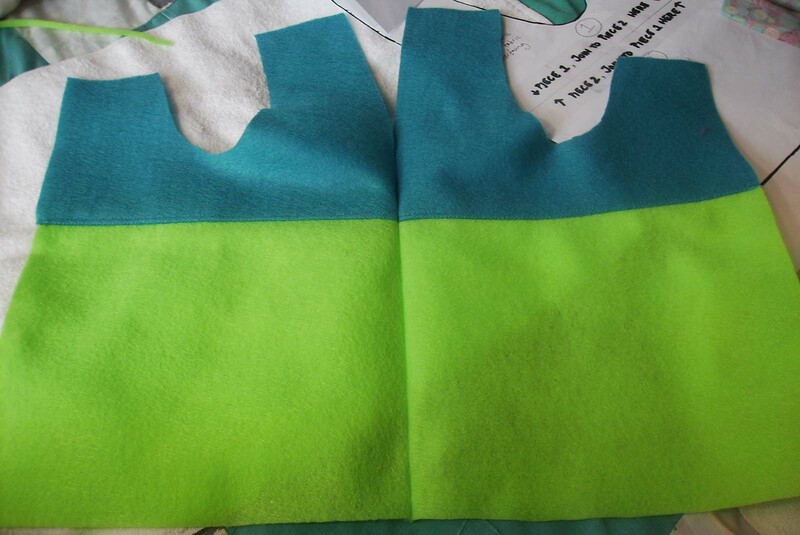 One top stitch seam done. 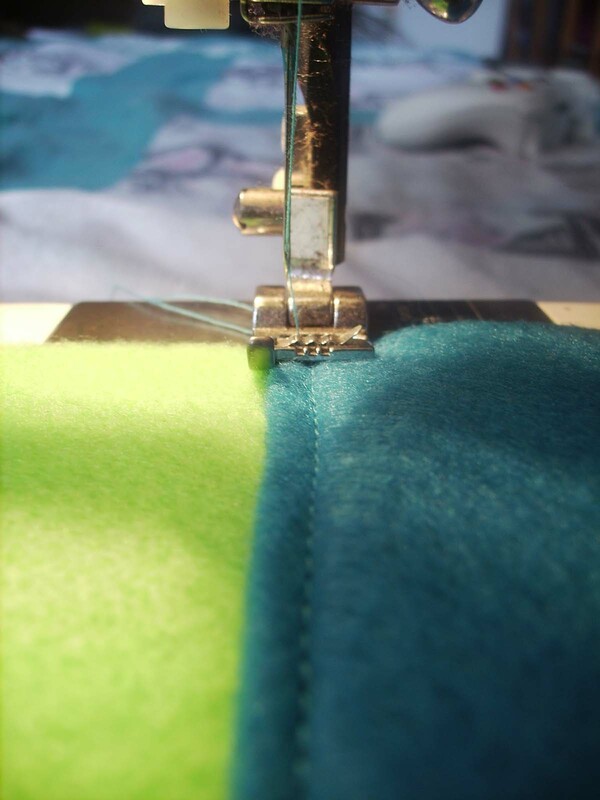 I use the foot to hold the fabric in place again, this time I run the edge of the blue to the left of the foot and move my needle to the farthest left position to stitch on the other side of the first tip stitch. 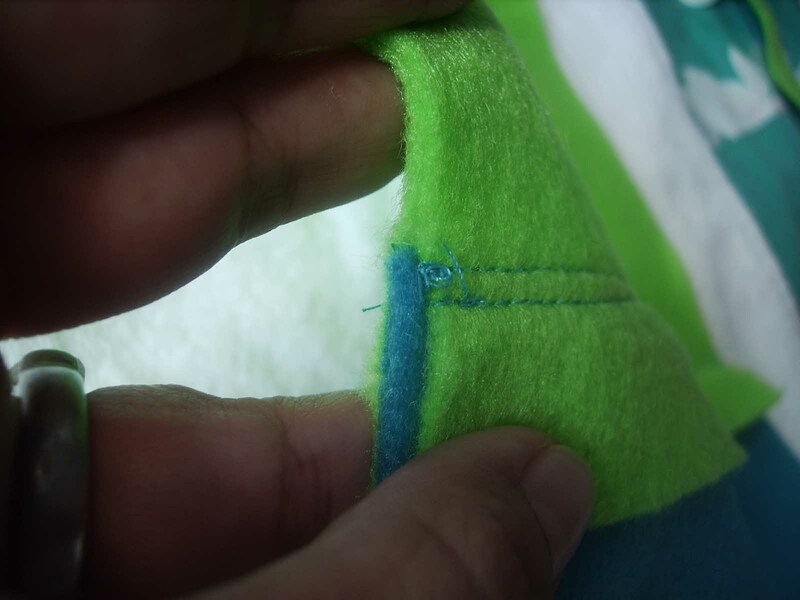 Here is the second top stitch seam. 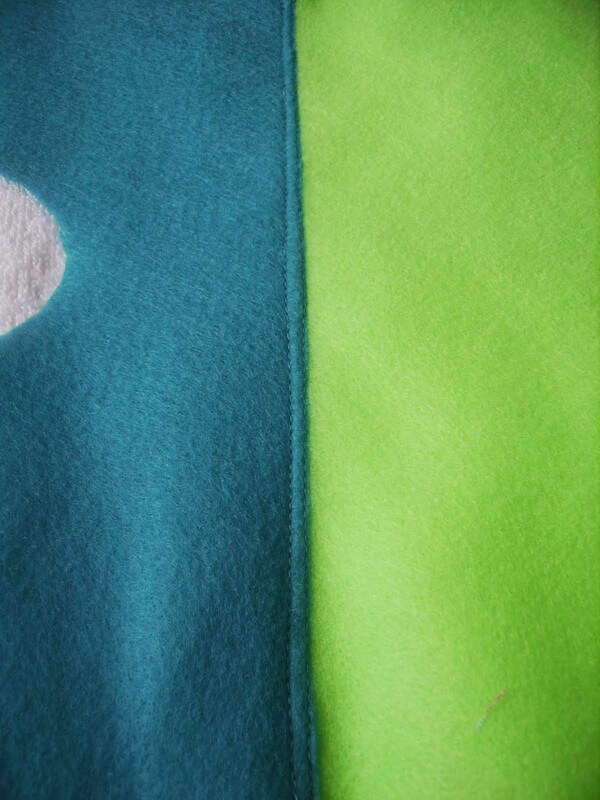 The result is a twin line of stitching to hold the fabrics together. 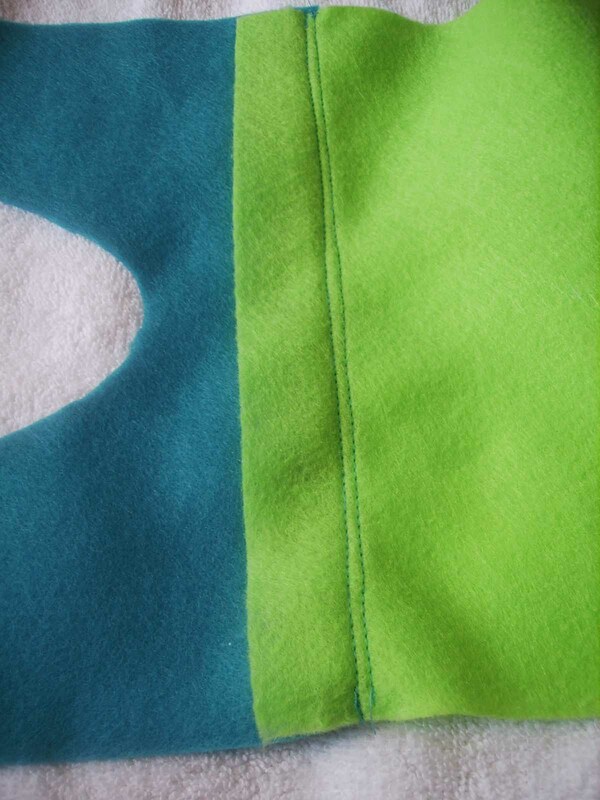 From the ‘wrong side’ of the fabric, it looks like this. I’m leaving all that overlap there and not trimming it. Match the splice or whatever piecing you do so that the edges of your creation are even. Be sure that it all lines up from the noticeable points. 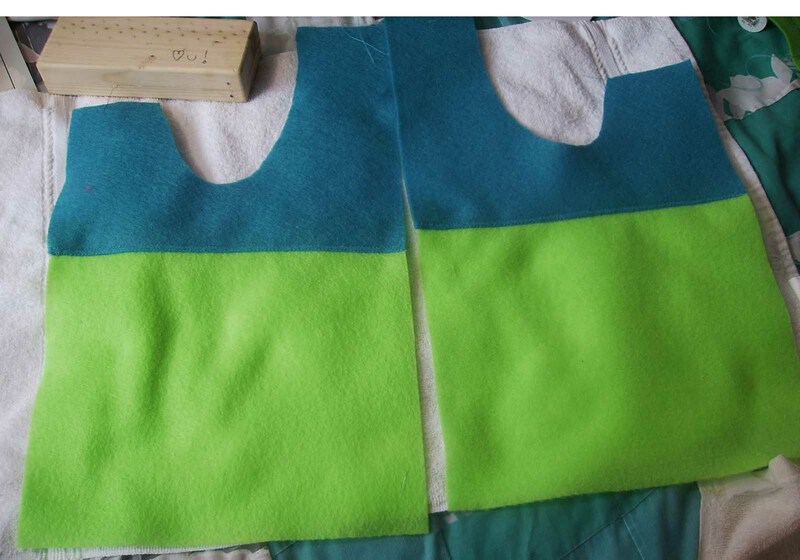 So, here you see the two pattern pieces. 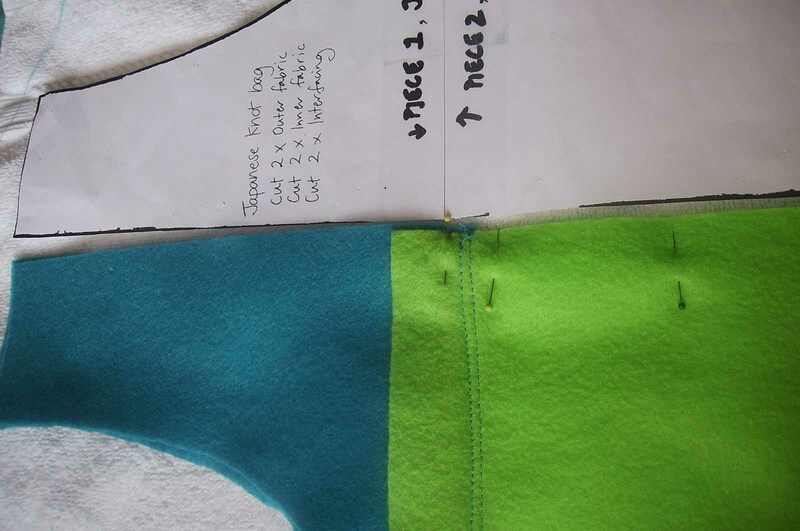 The line where the paper pattern is taped together is marked with a pin on the outer fabric. See the yellow pin head? Sew from there down to the bottom edge of the purse. 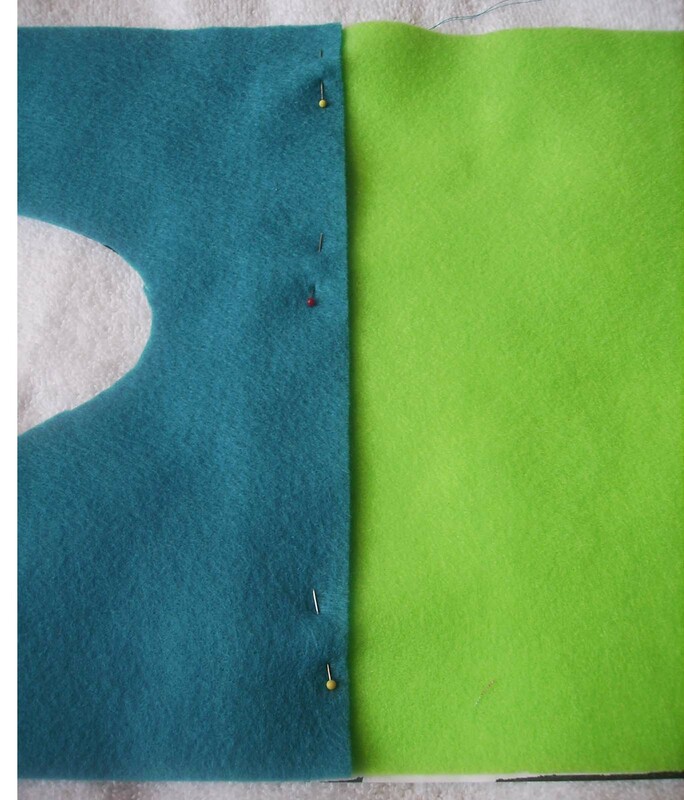 Start at the marked point (see the yellow head of the pin) and sew. Again, I used my foot to ride the edge of the fabric as a gauge. It keeps the seam even and straight. At this point, we cannot sew up the second seam, simply because we need to applique our snail portraits to this before going on. If you want to add anything to the outside of your bag, this is your stopping point. Add what you want to add. Just be careful not to add anything into the seam allowance around the bag’s edges. Just love your progress…your the best! Thanks for the happy ‘whoo hoo’s’!